This page gives general information about Stanmer Park, its attractions, facilities and current activiities. Funding has been won from the Heritage Lottery Fund and BIG Lottery Fund to undertake a restoration project in the park. Learn more about the Stanmer Park Restoration Project. With its beautiful woodland walks and extensive open lands, Stanmer is just as perfect for a family picnic as it is for a kickabout with your friends or a bracing walk over the Downs. Stanmer Park and Estate is an excellent example of the vast open countryside available in Brighton and Hove - and remains one of our most visited parks. It is also the city's largest park, and is a unique example of an 18th cCentury designed landscape. It lies within the South Downs National Park. The park is next to Sussex University on the outskirts of the city. A Public Spaces Protection Order (PSPO) is being enforced at Stanmer Park to assist in ensuring the park can be enjoyed by all. Find out about PSPOs in Brighton & Hove. thinning woodland to select for native and healthy trees. We had a public consultation on the plan in December 2016 and January 2017. 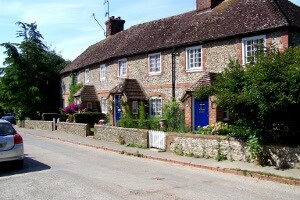 One of the park’s most unique features is Stanmer Village, a great example of an 18th Century working village, with Stanmer House as its main focal point. Stanmer's farmland, tea room and church create a village that is one of the many reasons Stanmer remains one of Brighton’s most visited parks. Check the Stanmer House website for details. Stanmer Park can be reached from Ditchling Road, and Stony Mere Way, off Lewes Road. There are also footpaths connecting to the South Downs and University of Sussex. The 78 "Breeze" bus operates at weekends, hourly. Frequent bus services 25 and 25X (from the city centre and central Hove) stop outside the main entrance to Stanmer Park. Service 23 from Brighton Marina, Eastern Road and Queen’s Park and service 50U from Hollingdean also stop at the park. Buses return towards the city from the bus stop in front of Falmer Station. Present your valid Brighton & Hove Bus ticket for that day at Stanmer House or Stanmer Tea Rooms and you will be entitled to a 10% discount. There are cycle lanes leading to the park from the city centre and various places to secure your bicycle around the park. For more information on cycling around the city check the Journey On site. There is limited parking available in designated car park areas for Stanmer Park visitors. In November 2017, we introduced an interim parking arrangement to tackle inconsiderate parking which was causing obstructions to emergency vehicles, the 78 bus, park residents and other park visitors, and those with disabilities. Clearly marked, designated parking areas have now been set up and enforcement is in place. Vehicles parked outside the designated areas are subject to a parking charge of up to £100. This arrangement will continue until the introduction of a paid parking scheme in the park. For enquiries about the parking enforcement, contact One Parking Solution direct. Read more in our press release. There are a number of volunteering opportunities at Stanmer Park. The number and scope of these will increase significantly from 2020 due to the Stanmer Park Restoration Project. You can also search volunteering opportunities on the Community Works volunteering platform. Permanent outdoor activity trails are being developed in Stanmer Park. The Brighton & Hove Healthwalks Scheme and local group Nordic Walking for Health offer regular opportunities to join in walks at the park. It is hoped trails for cross-country running and off-road family cycling will be offered in due course through the Stanmer Experience Project (SEP). The trail leaflets below were produced through the SEP, and funded by the South Downs National Park Authority. Two football pitches are available. Use our events diary to find more events and activities at parks across the city. Sponsored benches: There will be some additional benches at Stanmer Park as part of the restoration project. However, we cannot accept requests for new benches until later in 2020 due to restoration project works. More information: DedicateABench@brighton-hove.gov.uk.